WITH Radar – Weathernews Inc. 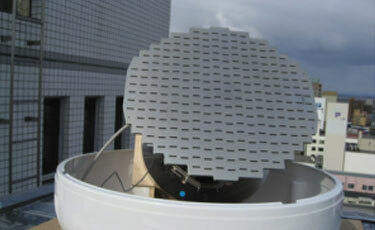 The WITH Radar was developed using aviation Doppler radar with the latest in meteorological technology in order to capture rapidly developing cumulonimbus clouds that often bring damage in the form of sudden torrential thunderstorms, wind gusts and tornados. 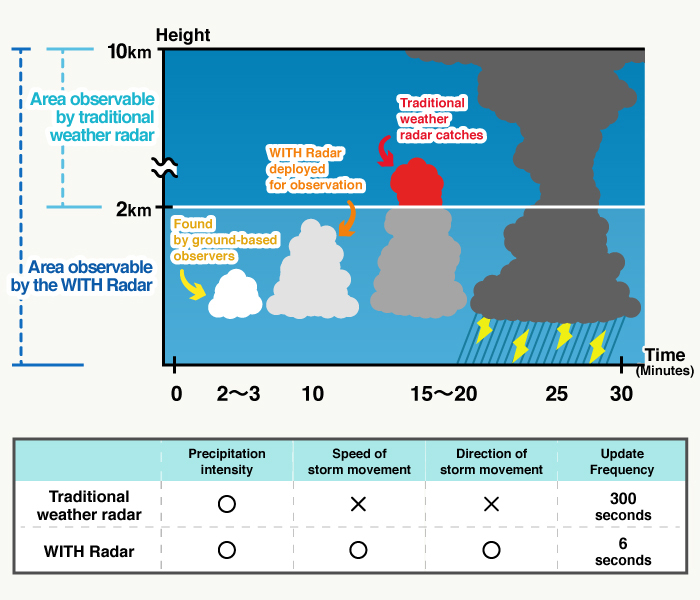 Normal weather radars are limited to catching clouds only 2km or higher with scans available only once every 5 minutes making it next to impossible to assess the try risks in advance. The WITH Radar makes a complete scan of a 50km2 area every 6 seconds and captures precipitation intensity, and the direction and speed of movement of the storm cell in the lower troposphere to capture clouds forming even lower than 2km. 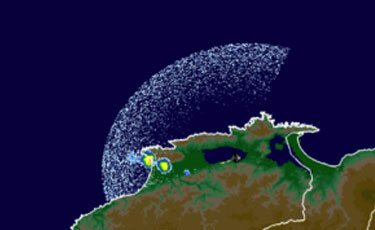 The scans are also three-dimensional allowing us to also capture the development of the clouds as well. 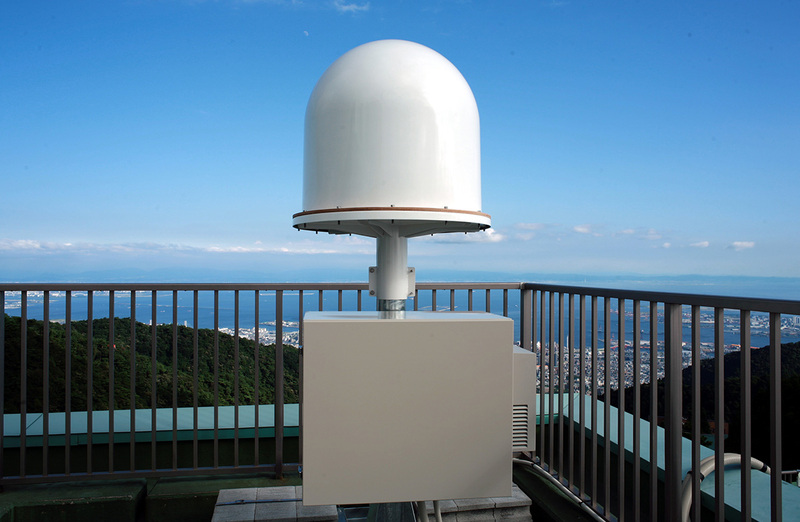 There are approximately 80 WITH Radars deployed in Japan, generally near major transportation centers, making it the largest radar network in the country. 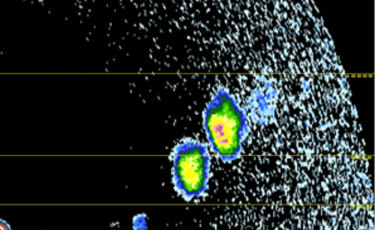 Can capture newly forming cumulonimbus clouds below 2km. Can be used to assess risk of sudden thunderstorms, gusts and tornados. 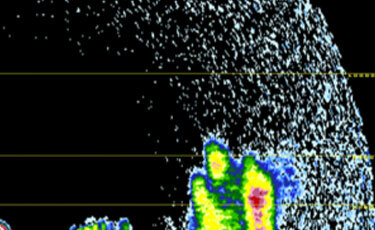 Cross section scan from a WITH Radar near Izumo City in Shimane Prefecture showed localized cumulonimbus clouds forming. The cross section scan showed that the cloud tops had grown to 8000 meters, which is a general threshold for potential lightning formation. 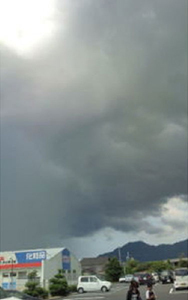 Just after this WITH Radar scan, Weathernews Supporters started to send photos of cumulonimbus clouds and reports of thunderstorms. 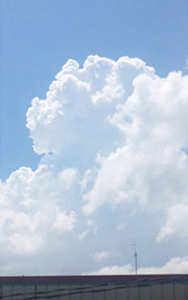 I felt a sense of fret so I looked out my window and saw this cumulonimbus! I hope it rains. Black, threatening clouds on the ocean side. I also saw a few lightning bolts.